It’s better to have more assets than liabilities, right? We love seeing the value of the things we own increase. Unfortunately, the value of our assets don’t always tell the whole story. In fact, instead of having income-producing assets, many of us have depreciating assets, or assets that might be time and money pits. 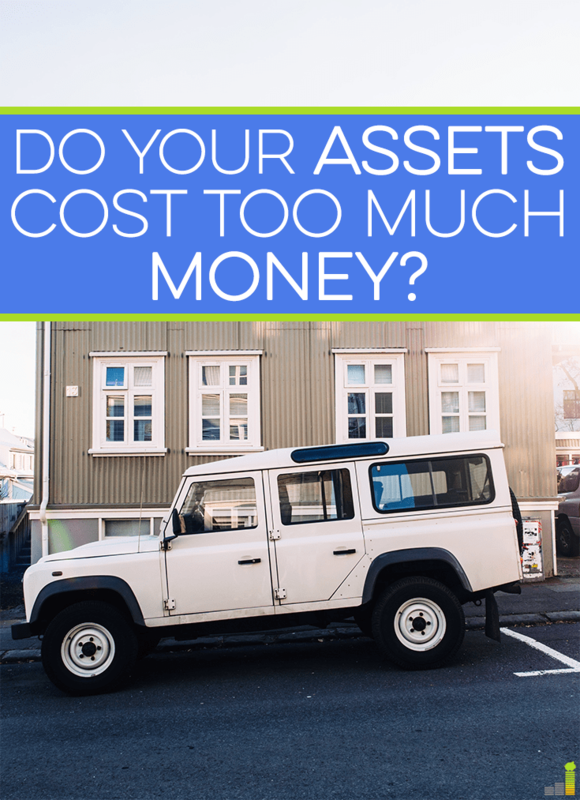 Do your assets cost too much money? If you want to optimize your finances (and possibly free up some cash to pay off debt), it can be worth evaluating your assets to see where you can save. Are You Paying More for Your Car Than It’s Worth? I’m sure most of you know how fast new cars depreciate when they’re driven off the lot. According to Black Book, the average depreciation of a car in 2015 is expected to be around 14 percent. That’s the average, though. Luxury and sports cars tend to depreciate even faster. You might need one to get from Point A to Point B, but you don’t need to have the newest model or the nicest trim with all the bells and whistles. Common advice for those with a lot of debt and expensive car payments is to sell the car and buy a less expensive one with cash. For example, if you own a pickup truck that costs you $400 per month in payments, $130 per month in insurance and another $300 per month in gas, you might be better off buying a compact car in cash and saving on all three expenses. I’ll admit, I think simple is better when it comes to cars. I have a 2002 Honda Civic, and my fiance has a 2013 Civic (he financed it as his old car was on its last legs). I prefer my car because there’s less that can go wrong in terms of electronics. I also prefer not having a monthly payment, but that’s a story for another day! If you own more than one vehicle, ask yourself if it’s necessary. Some families can get away with one vehicle. The other reason I bring this up is because my ex owned both a car and a motorcycle. Unfortunately, we lived in an area where winter made driving a motorcycle rather difficult. So it sat in the driveway with a cover over it until the springtime each year. He finally realized it wasn’t worth keeping. It was insured, financed and required a bit of maintenance (tires for motorcycles aren’t cheap). Being able to ride it half the year didn’t justify the expenses. Is Your Home or Mortgage Too Big? I heard so many people complain about how much their mortgage was when I lived in NY. The area I used to live in wasn’t known for being cheap – besides hefty home prices, property taxes were high, too. This sometimes made owning a home next to impossible for people. If they did own one, they often found themselves treading water. Lots of people seem to justify buying a home by saying it’s an investment. That’s debatable (and I won’t get into it because I’m not a homeowner), but a home is probably the largest purchase you’ll ever make in your life. I think it requires a bit more thought than some people give it. I’m guilty of walking around ritzy neighborhoods and marveling at the beautiful brick almost-mansion-status homes. However, I would never buy one. My 1,050 sq. ft. apartment is too big as it is! Unfortunately, many first-time home buyers are lured in by square footage because we’re taught to believe bigger equals better. And of course, more space also equals more stuff and typically higher utility bills. The other day I was listening to a podcast discussion about housing and couldn’t wrap my head around it. A few homeowners were saying they could easily go back to living in smaller spaces (600 sq. ft.), but then one said they weren’t sure how they were going to fill up the 2,500 sq. ft. house they recently purchased. I was left wondering why they bought it in the first place (perhaps they plan on having a large family). Don’t get me wrong – some people love living in a larger home and don’t mind having more rooms to clean. But I’ve seen just as many regret buying a house larger than they needed. It warrants asking yourself whether or not your house suits your needs. A lot can change in a few years. Perhaps your mortgage is eating up a larger part of your income than you thought it would. Maybe you’ve grown tired of all the space you have. Maybe you don’t want to live in a high cost of living city anymore. Or maybe you’d rather downsize and use the savings to accelerate your way to financial or debt freedom. Whatever the case, you should make sure your living situation is in line with your goals, as your mortgage can easily be one of the biggest reasons you don’t make a lot of progress. If you don’t want to change your living situation but need to make your mortgage less of a burden, think about renting part of your home out if possible. Speaking of which, don’t forget to include rental properties in this assessment, either. You might find cutting your losses to be the better option. Let’s not focus exclusively on physical assets when the assets in your investment portfolio matter, too. You want your money working for you as much as possible, right? One way to ensure that doesn’t happen is to be too passive of an investor. How many times a year do you check your portfolio? Have you ever gone through your 401(k) plan to see if the investments are any good? Do you blindly hand your assets over to a financial advisor without knowing how much they charge? If you’re like most people, you don’t have or take the time to watch over your investments as closely as you should. A free service like FeeX can help you find the best low-fee investment options in an old 401(k) plan. Also, someone like Personal Capital can help you get a good big picture view of all of your investments to easily spot ways you can cut costs and stretch your investment dollars farther. All of these can lead to fees eating up your profits. I once looked through the investments my parents had in their portfolio and was astounded at the expense ratios for their investments. They fell under the “my advisor manages everything” umbrella. When it comes to your investments and saving for retirement, it pays to be diligent about fees. Ignorance should be avoided. I’m someone who believes there’s always room for improvement. For example, I thought a 2-bedroom 2-bathroom apartment would be great in case my family came to visit. That’s only happened a handful of times since we moved. Even though my apartment isn’t an asset, I can’t wait to downsize to a 1-bedroom apartment to save money. Remember that you don’t have to stay chained to a car or mortgage payment you can’t afford. I know that’s easier said than done when faced with the prospect of moving, especially if you’ve been in your current house for less than five years. Everyone has to run the numbers for their situation. You should at least think about cutting ties with the assets that aren’t moving you toward your goals, or figure out how to change them so they do. 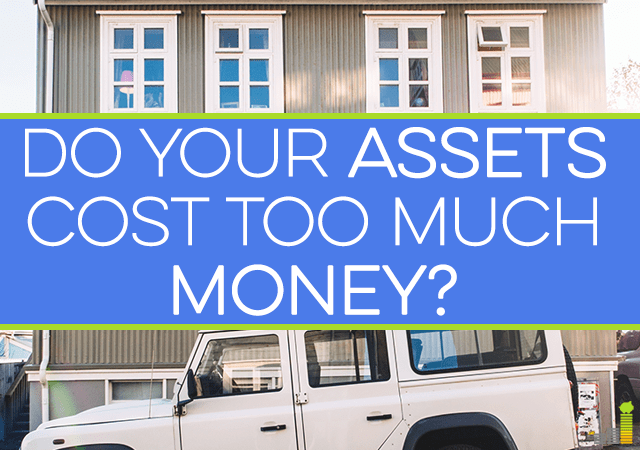 Have you ever owned an asset that was costing you more money than you realized? What did you do about it? Did you buy a home that was too big or costly for you? Do you make sure you’re not being charged obscene amounts of fees for your investments? Cash, securities, and real estate are assets. Private business interests might be assets, but usually need to be discounted pretty heavily. The rest? Not so much, although they certainly help make your point about cost. Great point – cash, securities, and real estate are what people should focus on building up. Your dad was so right about a boat being a money pit. I spent more money on that boat than I did on my rent at the time. The payment, insurance, and gas alone set me back about $1,000 per month. Crazy! Luckily I only had it for about six months, but I was only able to sell it for what I owed on it. Glad I learned that lesson, though. I’ll never own another boat. Wow, that’s crazy! My uncle had a boat, though it sat in the backyard most of the time, and I thought it would be “fun” to go out on the water whenever you wanted to. I don’t think I could stomach those maintenance costs, though. Great points! I completely agree that cars can hardly be seen as assets when they’re constantly depreciating, and using loans to pay for them means you’ll pay way too much for them with interest. Homes don’t typically depreciate, but I agree that the hidden costs of home ownership, like taxes and maintenance, can outpace the appreciation, especially considering how much interest is paid over 15 to 30 years. Yep. I don’t see how anyone could view a car as an “investment” in the typical sense. Then again, when I buy a car, I’m looking for something I can drive until it dies. Home ownership is tricky. I think smart buyers who put a lot of thought into their purchase (for the long-term) have a much better chance of coming out on top than those who simply buy their “dream house.” You do have to be careful about those hidden costs! It’s also good to keep in mind that living small in some areas can allow you some flexibility in others. We are a one car family (my husband bikes to work year-round, even in the MN winters!) and our car is an older Toyota Corolla that’s paid off. When we got married a few years ago, we had a tiny ceremony and no real reception (just went out to dinner with a few friends.) This allowed us to have the savings to buy a little larger home than we technically need at the moment (still only 1600 square feet) but with one kid and another on the way, we didn’t want to have to worry about moving again in 5 years when we needed the extra space. It’s helpful to keep in mind when you are living a little smaller in one area, that it can give you some different options for other areas, if you so choose. Yes, I definitely agree with that! There are always trade-offs that can be made, and it also helps to think long-term like you did. Buying a larger house because you’ll have a need for it is very different from buying a larger home because you think of it as a status symbol. My cousins purchased a humongous home a few years ago (it’s beautiful, but SO much space! ), and plan to have just one kid. They don’t even own a lot of things, so it’s not cluttered. I’m more about functionality, I guess! Assets are great but if you take on a lot of debt that has to get serviced to pay off those assets, they aren’t beneficial to your net worth at all, and in fact can be a drain. You have to look at both sides of the equation to get a true measure of value. Well put! That’s why I don’t think a home is an automatic asset/investment. You have to take so many factors into consideration for that to be true. Your net worth doesn’t tell the entire story. Boats certainly are a big spot in the water to dump your money into. Another is having huge yards covered in grass that requires paying to keep it green with your metered utility water. The mowing, the fertilizing, etc all more costs. I have a quarter acre lot and utility water is very expensive. I removed a lot of grass when I moved in and converted it to a more natural but less thirsty state which is still beautiful to look at. Nice job! If I ever own a home, I definitely don’t want too much yardage. It doesn’t seem very fun to deal with! These points are so true! We have a car that is worth $2k right now but the maintenance for it is several hundred dollars. It’s still running and we wouldn’t want to buy a new car at this point but when we think about the cost vs value, it’s a bummer! I hear ya, Jen. My car isn’t worth much right now either, but it only has 100k miles on it, so I’m hoping it has a lot more life left! It can be difficult to decide whether keeping an old car is worth the repairs in comparison to the price of a newer car.